1 May - 24 Oct.
25 Oct. - 20 Dec. Please send a request directly to us for any reservation concerns or enquiries. One Bedroom Studio : 1 double bed. 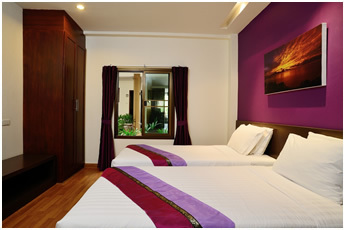 The room rate is good for 2 people - 1 extra person allowed (with appropriate charges). 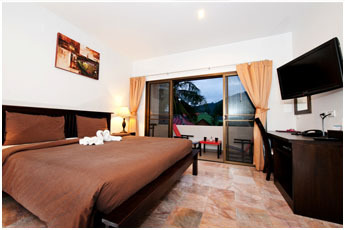 Note that these rates for our accommodation in Phuket, Thailand may change without prior notice. One Bedroom Apartment Mountain View : 1 double bed or 2 single beds. The room rate is good for 2 people. - 1 extra person allowed (with appropriate charges). One Bedroom Sea View : 1 large double bed. The room rate is good for 2 people only. 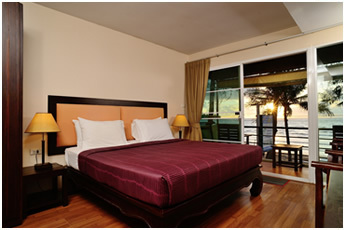 Two Bedroom Deluxe Suite Apartment Sea View : 1 king-size bed and twin beds. 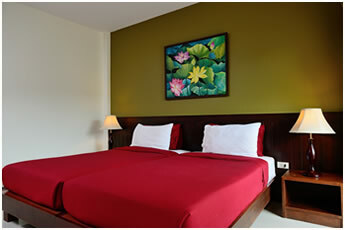 The room rate is good for 4 people - 2 extra persons allowed (with appropriate charges).